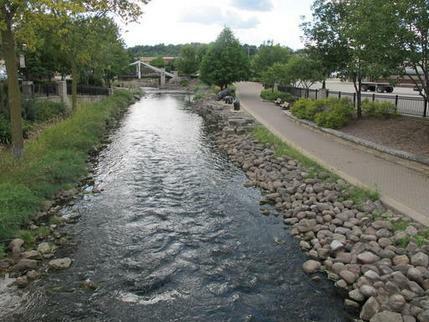 In this Sept. 12, 2013 file photo, the Fox River flows through downtown Waukesha, Wis. A push for expanded access to water from the Great Lakes is at a key point for the city of Waukesha. A regional regulating body meets in Chicago Thursday, April 21, 2016, to consider a request from the Milwaukee suburb to draw from Lake Michigan. The group's upcoming recommendation promises to have major implications for future requests from other cities that might want to stick a straw in the Great Lakes someday. (AP Photo/John Flesher, File) Read more here.